03/07/2018 - Global agricultural production is growing steadily across most commodities, reaching record levels in 2017 for most cereals, meat types, dairy products and fish, while cereal stock levels have climbed to all-time highs, according to an annual report from the Organisation for Economic Cooperation and Development (OECD) and the UN Food and Agriculture Organisation (FAO). The report stresses that agricultural trade plays an important role in promoting food security, underscoring the need for an enabling trade policy environment. OECD-FAO Agricultural Outlook 2018-2027 sees weakening growth in global demand for agricultural commodities and food, while anticipating continuing productivity improvements in the sector. As a result, prices of main agricultural commodities are expected to remain low for the coming decade. 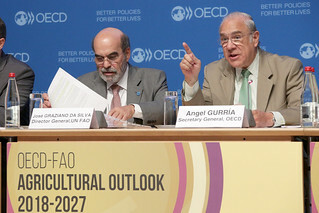 The report, presented in Paris by OECD Secretary-General Angel Gurría and FAO Director General José Graziano da Silva, attributes the demand slowdown to a deceleration of demand growth in major emerging economies, stagnating per capita consumption of staple foods and a further gradual decline in global population growth rates. The Outlook finds that global agricultural and fish production is projected to grow by around 20% over the coming decade, but with considerable variation across regions. Strong growth is expected in developing regions with more rapid population growth, including Sub-Saharan Africa, South and East Asia, and the Middle East and North Africa. By contrast, production growth is expected to be much lower in developed countries, especially in Western Europe. The Outlook projects that the weakening of global demand will persist over the coming decade, sapped by declining population growth, flat levels of per capita consumption for staple foods and slowing demand growth for meat products. Declining demand growth for meat products will put a brake on the demand for cereals and protein meal used in animal feed. Demand for cereals and vegetable oil for the production of biofuels is expected to be largely unchanged over the forecast period, in contrast with the past decade, when biofuels expansion led to more than 120 million tonnes of additional cereals demand, predominantly maize. With existing policies in developed countries unlikely to support biofuels expansion, most demand growth will come from developing countries that have introduced policies favouring biofuel use. In particular, the use of sugarcane for biofuel production is expected to increase. This year’s edition of the Agricultural Outlook includes a special chapter on the Middle East and North Africa (MENA), which faces simultaneous issues of food insecurity, rising malnutrition and management of limited natural resources. Undernourishment is concentrated in countries riddled by conflict and political instability. In other countries of the region, food demand is rising fast, due mostly to population growth. Very high consumption levels of wheat together with a continually rising sugar and fat consumption are leading to an alarming spread of overweight and obesity in the region. While the region’s agriculture and fish production is expected to increase by 1.5% annually, it will be increasingly challenged by both limited land and water resources and the expected impact of more frequent extreme climate-related events. As a result, import dependence will remain high for most commodities. The Outlook recommends that countries in the region reorient policies away from supporting water-thirsty cereals, toward greater support for rural development, poverty reduction and farming of higher-value horticulture products. The OECD-FAO Agricultural Outlook 2018-2027 is free to read online on the OECD iLibrary. You can also access the indicators in our interactive Compare Your Country tool or download the raw data at www.agri-outlook.org. For further information, journalists can contact OECD Media Officer Lawrence Speer (+33 1 45 24 79 70) or the OECD Media Division (+33 1 45 24 97 00) or FAO Communication Officer Christopher Emsden, christopher.emsden@fao.org, +39 06 570 53291.